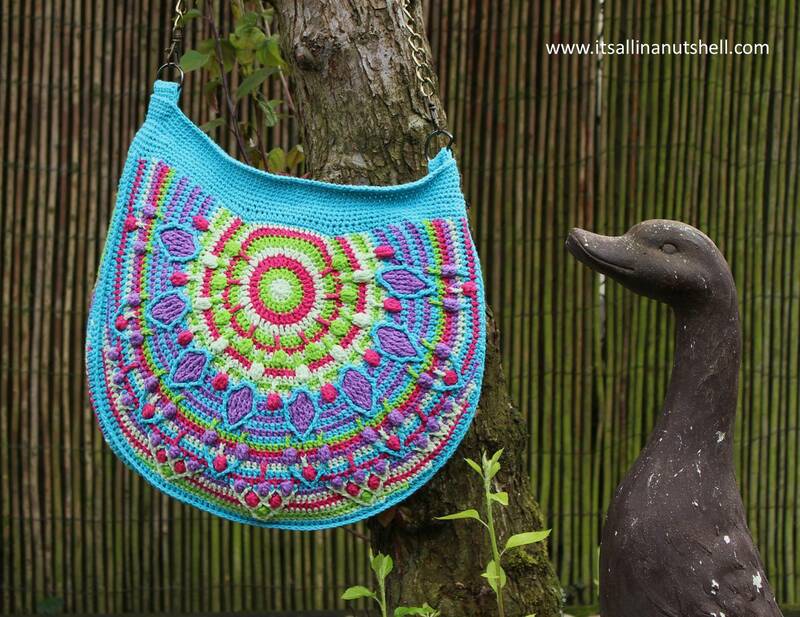 My Peacock Tail Bag designed by Tatsiana from LillaBjorn Crochet is all done. The bag is beautiful, sturdy and a great accessory for every day use. In this post you find all the information you need to make your own bag. I did not follow the colorway set in the pattern; I am always very bad at following color instructions. I used 6 balls of Scheepjes Linen Soft yarn in the following colors: 2 balls of 614 as that is my main color, and 1 ball each of 622, 625, 626 and 627. I made my bag with a 3mm hook. I did not follow the color placement as given in the CAL exactly. You can find all the details for my colorway in my color chart where I break down the colors per row and side. I have made step-by-step video tutorials to help you make your own bag. On my dedicated Peacock Tail bag page and on my YouTube channel I have grouped all the videos together. I have a separate video for the front and back parts and a video showing how to assemble everything. I have too many things in my crochet project cupboard and need to make some space. I am selling my Peacock Tail Bag in my Etsy shop. Includes free international shipping. With this my Peacock Tail bag is completed and if you made a bag of your own I would love to see it. Feel free to share your work with me on my Facebook page, in my Facebook group It’s all in a Nutshell Crochet Nuts, tag me in one of your posts on Instagram or use #itsallinanutshell. I love your colours and thank you SO much for the wonderful videos – they really help make things easier. I was going to put a zip in my bag too – I think it looks so much better and stops everything falling out! I look forward to more of your videos. My daughter is using your “How to crochet” videos as she is just starting out by making the Last Dance blanket so a big thank you from her too. thank you for your kind words 🙂 I am so happy to hear that you and your daughter enjoy them so much. hope to see you again soon for a new project. Your bag is lovely and I really like the idea of putting in a zipper. I find with bags that don’t close all the way I am always obsessively checking that everything is still inside and hasn’t fallen out! I have finished my crocheting but still don’t have a handle. Woolwarehouse carry the handles used in this project. As such, many shops carry all kinds of handles. Hope you can find one you like.